Last week’s announcement of the 2015 Nobel Prize in Physics will not only have given great satisfaction to the recipients, Takaaki Kajita and Arthur McDonald, but also to their many friends and colleagues both inside and outside the Super Kamiokande (Super-K) and Sudbury Neutrino Observatory (SNO) collaborations. Parochially, wearing my Oxford hat, this award also gives me much pleasure since Oxford has from the outset played a leading role in SNO. In many ways the award forms the keystone of our current understanding of neutrino physics. The 2002 award to Raymond Davis and Masatoshi Koshiba marked the beginning of the field of neutrino astronomy, with the detection of solar neutrinos and the proof that they originated from nuclear fusion within the sun. Like all the best discoveries, this one opened up new questions and puzzles. It was almost immediately clear that there didn’t seem to be enough solar neutrinos given our understanding of the mechanisms by which the Sun shines. The solution of this puzzle seemed for many years obvious to non-experts such as myself. Since our understanding of the Sun involved astrophysics, plasma physics and nuclear physics in extreme conditions, the application of Occam’s Razor implied that clearly there must be a mistake in the calculations in one of these areas. 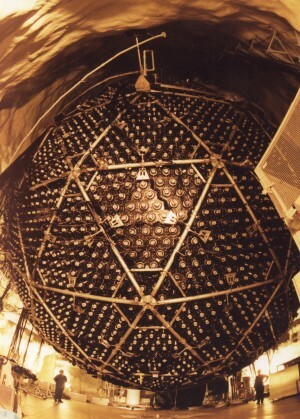 It is a great testament to the genius, hard work and sheer persistence of John Bahcall that eventually it could be shown that it was highly unlikely that there was enough wrong with the so-called Standard Solar Model (SSM) to explain the deficit of neutrinos observed deep under the Earth’s surface where the detectors were situated. There is perhaps no more egregious example of someone who ought to have received a Nobel Prize but didn’t than John Bahcall – unless it is Nicola Cabibbo of Italy (for Cabibbo mixing) or George Rochester and Clifford Butler of the UK (for the discovery of strange particles). Sometimes the Nobel Committee works in ways even more mysterious than Nature itself. If there was nothing wrong with the SSM, then we are forced to rely on Arthur Conan-Doyle rather than William of Occam. “How often have I [Sherlock Holmes] said to you [Dr. Watson] that when you have eliminated the impossible, whatever remains, however improbable, must be the truth?” (“The Sign of the Four”, 1890). The only other possibility to explain the apparent neutrino deficit was that neutrinos were being lost on their way to the Earth, “oscillating” into another sort of particle. The race was on to find out what and how. Two separate lines of attack suggested themselves to the experimenters: capture as large a number of neutrino interactions as possible to measure the neutrino deficit accurately; and devise apparatus that could detect the “elastic scattering” and “charged current” interactions, mostly, or indeed for the latter solely, sensitive to electron-type neutrinos, and simultaneously detect the “neutral current” interaction, sensitive to all three types of neutrino. It was the combination of these two approaches, in Super-K and SNO, respectively, that both verified the SSM and left no room for doubt that the impossible, however improbable, was actually happening. Neutrinos oscillate, establishing, from the application of basic quantum mechanics, that they must therefore have a mass. This was the first, and remains the only, breach in the Standard Model of particle physics, which has been around almost, but not quite, as long as I can remember and has repulsed all our other attacks. This reason alone, not even taking into account the exquisite experimentation of both collaborations under the leadership of Kajita and McDonald, is enough amply to justify the award of the 2015 Nobel Prize in Physics. What has any of this to do with the ILC? Well, directly, not much at all. Indirectly however, to those of us not in the field of neutrino physics, it gives further evidence for the strength of particle physics and the esteem in which it is held. Five of the last fifteen years since 2000 have seen Nobel Prizes awarded for discoveries in particle physics, more than any other subject. Furthermore, it reminds us that precision and careful experimentation can produce new insights into Nature without going to the “energy frontier”. In proposing the ILC, we learnt from the lessons of history. Just as the Large Electron-Positron Collider (LEP) at CERN unambiguously pointed the way towards the discovery of the top quark through precision exploration of quantum corrections, so the ILC can discover new phenomena. Indeed the situation is even more promising than for LEP, since the W and Z were already theoretically well understood particles, whereas the properties of the Higgs, whose discovery precipitated the award of the 2013 Nobel Prize, are almost wholly unknown. Its very existence, the only fundamental scalar we know of and one whose sole reason to exist is an imperative embedded deeply within quantum field theories, is itself a mystery. There has never been a better reason to build a new accelerator and there has never been a proposal for a new collider that is more advanced or in better technical shape than the ILC. The nomination of a Japanese scientist as one of the 2015 Laureates further strengthens the position in Japan of fundamental science in general and elementary particle physics in particular. The time is indeed ripe for Japan to proceed to the next stage with the ILC project. As usual, Conan Doyle has quotations that highlight our aspirations: “It has long been an axiom of mine that the little things are infinitely the most important.” (“A Case of Identity”);” ‘Data! Data! Data!’ he cried impatiently. ‘I can’t make bricks without clay.’ ” (“The Adventure of the Copper Beeches”); “It is a capital mistake to theorise before one has data. Insensibly one begins to twist facts to suit theories, instead of theories to suit facts.” (“A Scandal in Bohemia”). The ILC and the LHC together can provide the data we need to emulate Kajita and McDonald and push into that world beyond the Standard Model that will assuredly provide the raw material for the Nobel Prizes of the future.